The reasons Cruise could get away with all of these evils - and still become the biggest star on the planet – are due to the two attributes mentioned above. He is first and foremost a terrific actor (and one assured enough to have little or no problem with allowing his co-stars to either share or steal the screen from him) but – and here’s the weapon – knows that that indefinable on-screen charisma, that relationship between himself and what and, more importantly, how the camera captures him, is enough to create empathy with hose watching. Thus, you want Maverick to succeed, you want Charlie Babbitt to find redemption, and you need Jerry Maguire to have her at hello. It’s a unique combo possibly in all of screen history, and on many occasions the man’s good looks and killer smile have unfairly masked just how brave his choices as a major leading man have been. 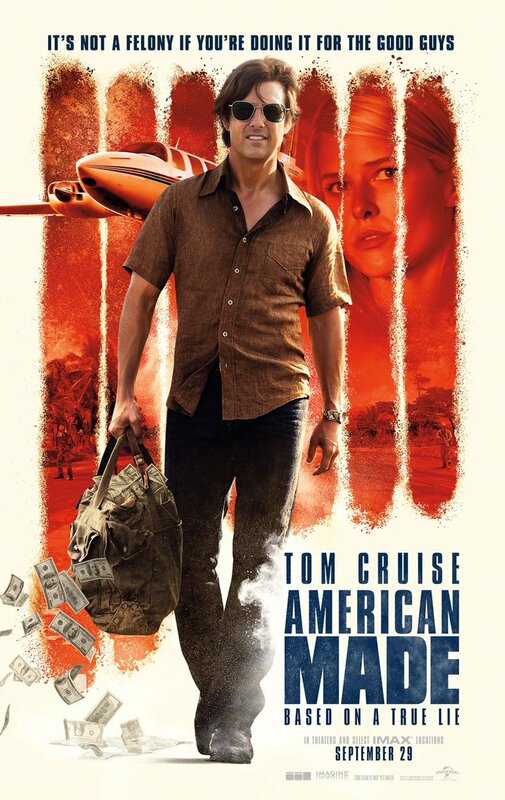 Now, American Made is not in the league of any of those above, but it is certainly the first time in what feels like far too many years that Cruise has reached for that muscle, and found a director who knows how to let him flex it. The collapse of the star system and the need to court the world market have reduced the subtlety of what Cruise has done before into a procession of action men and increasingly large stunts. Now, we love the Mission Impossible movies as much as those in the next sold out multiplex, but damn, it’s nice to see old school Tom smiling back from beneath those aviator shades once more. And working with a director who truly understands the value – and ability - of the man. That said, this tale of late’70s/early ‘80s pilot turned CIA covert operative turned drug runner Barry Seal is not the best movie either have ever made. But it is slick, funny, borders on absurdist, has something to say, says it well, and does it all in the glare of a note-perfect star performance, that sees the screen rarely missing a Tom for its entire running time. Its historical veracity may be debateable, but as a “yarn” with some basis in reality t’s a fine one, with Domhnall Gleeson also getting to show his range as Seal’s CIA link. It’s big, it’s brash, it’s easy to underrate, but there’s an awful lot going on underneath its surface. It’s practically a metaphor for Tom Cruise himself.